It can be tempting to ditch a KPI that doesn’t tell the full story. But KPIs can’t and shouldn’t – they should trigger and guide our decisions, not make them for us. 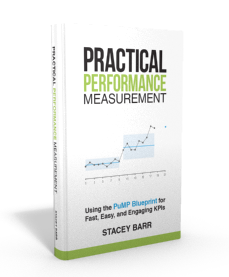 You might notice how often people want to ditch a KPI or performance measure because it fails to give the complete story. Or fails to tell the full truth. They don’t want to be held to account for one number. And they don’t have to be. People are accountable for results that matter, not hitting numbers that are convenient. Great KPIs work together to help us make our decisions. KPIs don’t work in isolation. But, it’s absolutely fine for a single KPI to be the trigger that a decision might need to be made about something. Then other measures or KPIs can help guide that decision. How decisions are made with KPIs. Recently I noticed that my Website Visitors had dropped *significantly*. Rather than make the decision that my website needs better SEO and better content, this measure was just the trigger to look closer. The problem was the Google Rank. It had plummeted into an internet black hole. Bad, bad news. There was a decision to be made, but I still didn’t know what it was yet. And more KPIs were not going to help now. The question now was “what causes dramatic drops in Google rankings?” And KPIs were not going to answer this question. Research was the only way. And research uncovered a likely culprit: dodgy backlinks. Dodgy backlinks are tasteless and irrelevant and dishonest sites that have links to your site. They ruin your online reputation, and earn you a Google Penguin penalty. In Google’s Search Console, you can easily find a list of the backlinks to your site. And I found some very disturbing ones. Someone is routinely sabotaging my Google ranking by setting up links to my website on spammy sites. Sadly, this is just part of the way the internet works these days, in the competition for first-page search results. So I spent a whole day sorting through the thousands of backlinks, and selecting the spammy ones to disavow with Google. There were hundreds. And my decision became clear: set up a routine to review backlinks, and disavow the spamming ones. KPIs don’t make decisions for us. Imagine if a decision-making team jumped to premature conclusions about their Website Visitors dropping. The obvious decision to many would be to go hammer-and-tongs on SEO. How much time and money would they waste, and how much worse would the problem get, if they made that decision? Use KPIs that have strong and clear alignment to results that matter (not just the easy-to-measure ones). Link your KPIs in a relationship map, like this Results Map. Know the relationships among your KPIs so you know which role they should take in decision making. Take an iterative approach to solving bigger performance problems, because often you don’t know what information you’ll need until you learn more. Decisions are made with KPIs, not by them. 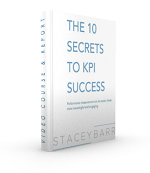 Don’t reject a KPI just because it’s not the complete truth. 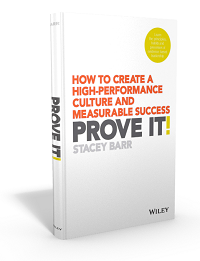 Do you see a tick-and-flick mentality with using KPIs in your organisation? And a tendency to reject KPIs because they are less than the truth? These are symptoms that you organisation has a limited approach to using KPIs. Your article really resonated with me. I have seen KPI’s removed because they do not give the message that are required! A classic one is “Sales per month”. The trend that is expected is one of that goes up. If that is not what is seen a company can decide to measure the number of phone calls or visits their sales people are making and drop the actual sales KPI. They just changed the KPI from a result of effort to the effort. I think you’ll also like the topic I write about next… our attitude to measurement really matters if it’s going to serve us. Yes, I see people refusing to do the work that you describe so well. I call it “drilling down” into the numbers. This is something all accountants and auditors learn to do as a regular part of our work. It is good to see that lesson being taught to people who often missed the rigor that is expected of their financial people. We use “internal controls” to help us increase the reliability of the numbers with which we work. It costs more to do this but making sure that the controls are working is necessary to maintaining our credibility. And accountants are often the bearers of undesirable news. Are internal controls established when KPI’s are collected? Really you did a fabulous analysis to find out the exact and correct reason (backlinks)instead of blaming the KPI. Thanks Sambasiva. It can be hard to find the patience to dig into performance problems, rather than jump to a hasty conclusion.